Card Text Play: Unstun each friendly creature. Flavor text Thy body is an illusion. Only thy spirit is eternal. 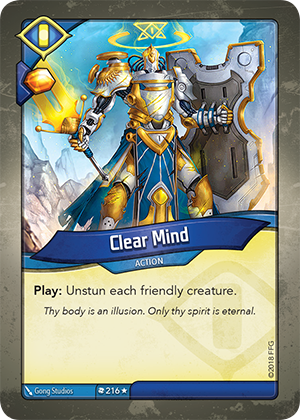 Can Clear Mind be played if I have no creatures? Yes. Don’t forget to collect your Æmber bonus for playing the card.